This is the most expensive helmet I’ve ever had, but it’s also the one I use most regularly. Everyday riding sees plenty of fuel-stops, and not many things get me more annoyed than being asked to remove my lid at the filling station. Flipping this up means I never get hassled again. The convenience of being able to pop the front of the lid wide was also proven when a péage in France refused to take my credit card. Border crossings, easy; asking for directions, piece of cake; popping the lid on without having to take my glasses off, simple. You get the idea… I’m sold on flip-fronts. My brother-in-law – a bike instructor – loves them because he can have a fag whilst riding. 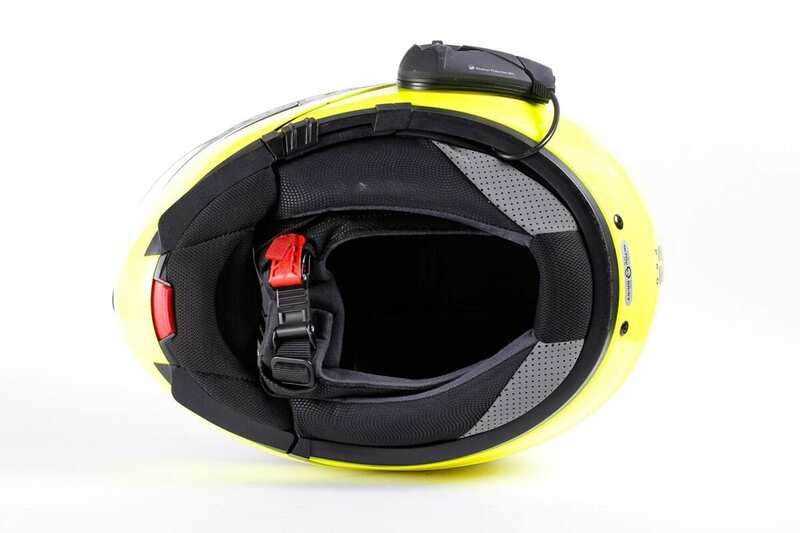 The C3 Pro is a premium lid and TranAm – the UK importers – are so confident of its quality that the two year warranty can be upgraded to five years by registering online if the helmet was bought in the UK after 1st January 2014. 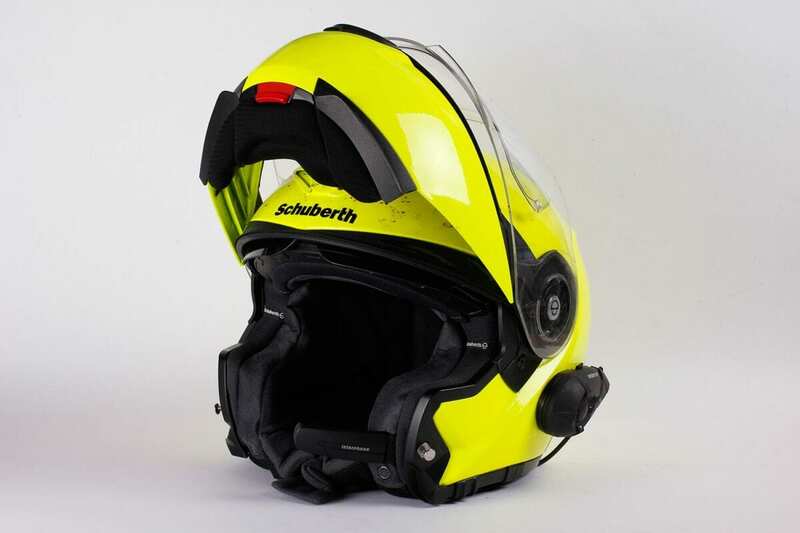 Rated as a full-face with the chin bar down, the Schuberth weighs just 1570g, and comes with a drop-down sun visor, acoustic collar to reduce wind noise around the neck, a removable and washable Coolmax liner, anti-fog Pinlock visor and integrated antennae. 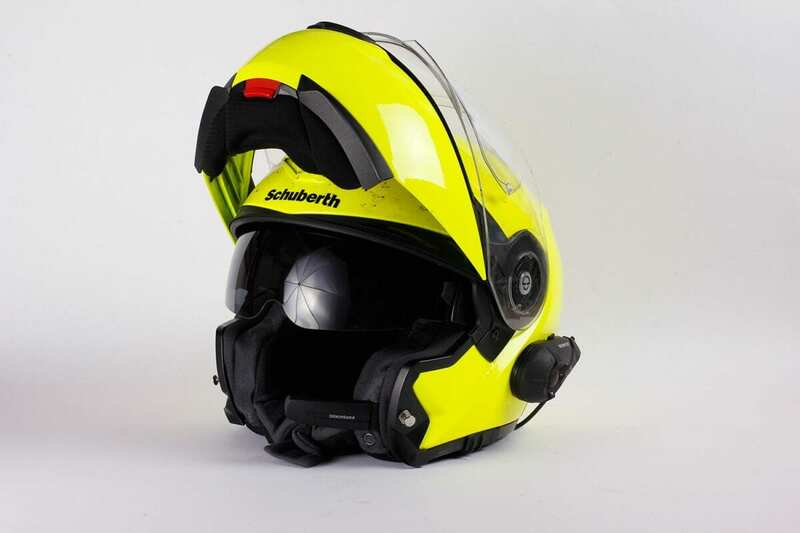 These are great for improving intercom range and FM-radio reception, but only if you use the £299 Schuberth Bluetooth system. It’s a neat design that replaces the neck skirt, but I already had the brilliant Interphone F5MC with its C3 Pro-specific audio kit. 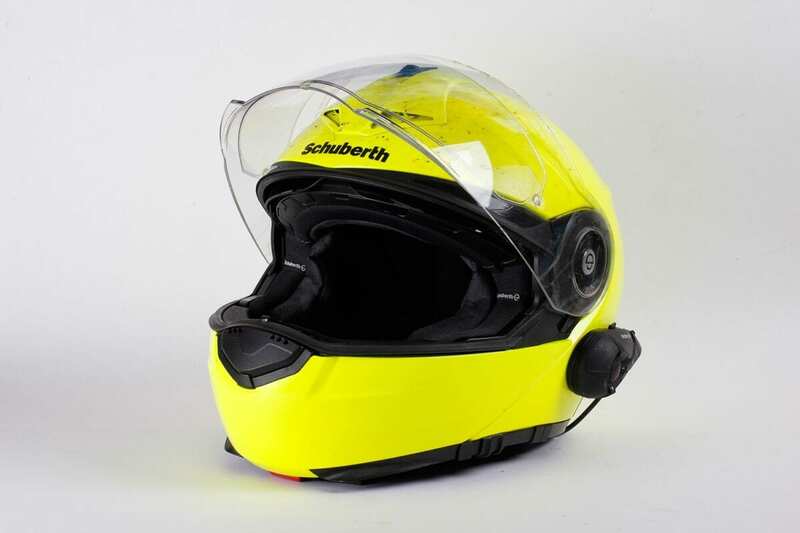 It’s easy to wear the helmet all day, fitting my head perfectly – of course, it’s important to try any lid on before you buy it to see how well it suits you, but the plush interior and two shell sizes shouldn’t see many people struggling. The glass-fibre and resin shell is designed with an integrated spoiler to minimise lift; it’s certainly stable at speed (even when flipped open), and also surprisingly quiet. I still wouldn’t wear it without earplugs, but it’s impressive nonetheless. The vents are very effective, shifting a claimed 9 litres of air every second at 62mph – the effect of each of the two can be easily felt as they’re opened. In busy traffic, it’s easy to crack the visor open (or of course flip the lip open fully), though I’d have preferred a slightly narrower ‘just open’ setting. 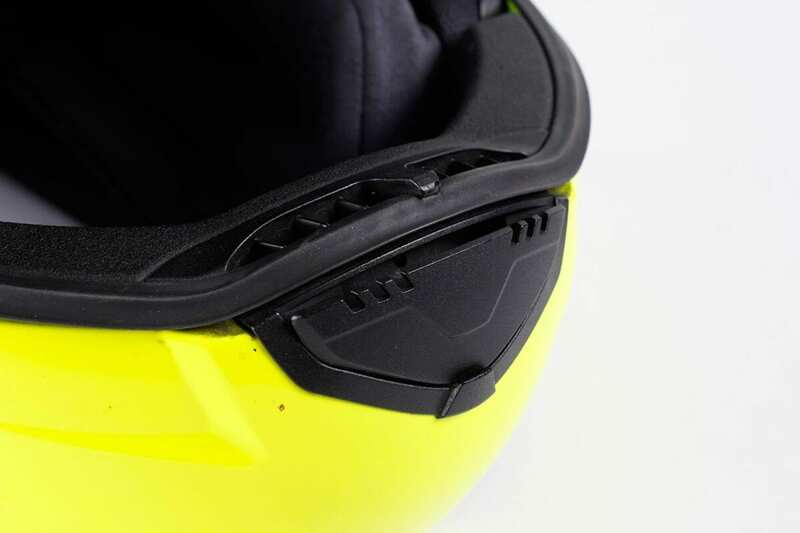 The visor can also be locked down, though not by pressing the visor’s ledges (it’s good to see one on either side) – to snap it down fully you need to press down on the top edge of the visor at the middle. The sun visor is easy to drop down, with a sliding button on the lower left of the lid. I’d like it to be a little lower at the cheeks, as I find the light that leaks around the bottom a little distracting. 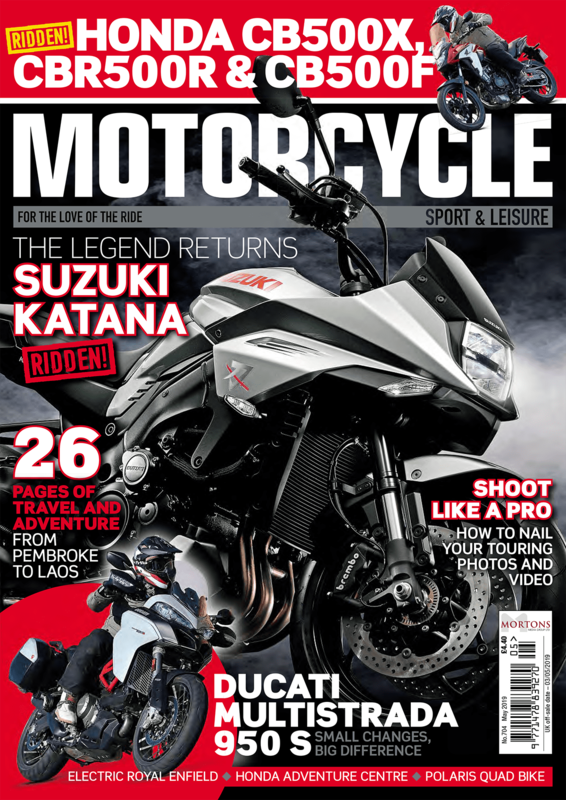 Having said that, I’m used to riding with a dark outer visor, so many riders might not be bothered by this. The top vent assembly can be snapped off easily for cleaning, and the lining went through our washing machine with no problems. 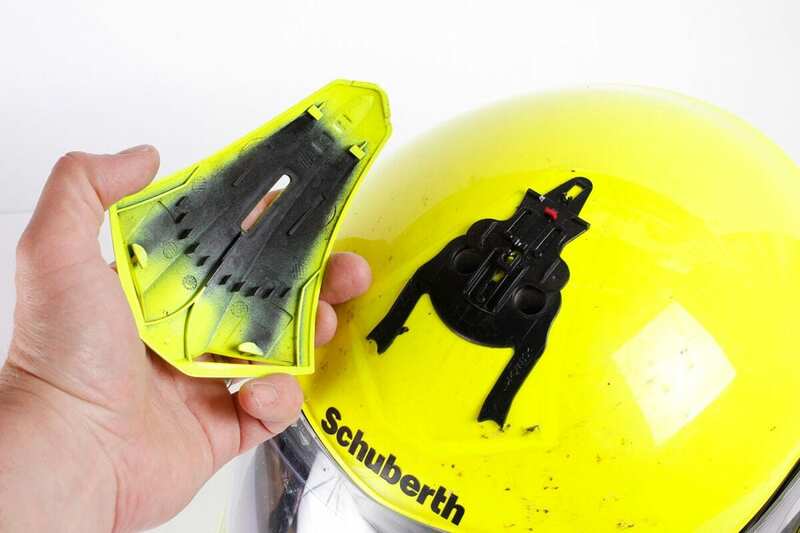 There have been a couple of glitches – one of the plastic visor locking levers fell out (the visor was still totally secure), and one corner of the Velcro pulled away from the Microlock strap fastener cover. The neck skirt is held in with small pins – one of these also broke, though that was after repeatedly stripping the helmet for an intercoms test. TranAm sorted everything very quickly and efficiently; not because I’m a journalist writing about the product, but because the five-year guarantee covers all of it, without question. The replacement lever is also far more secure, so I don’t foresee any more issues. In plain black or white, the C3 Pro costs £479.99 – still a lot of money, but this is a top-quality helmet. It’s also available in a women’s fit, with a redesigned interior. I’d have another in a heart-beat (though maybe in a more subtle colour next time).